The best Mixed Reality headset yet? The Lenovo Explorer is a good example of the potential of the Windows Mixed Reality platform, with an established manufacturer turning its hand to producing a well-built headset that handles virtual reality games and experiences well. Windows Mixed Reality headsets, like the Lenovo Explorer we're reviewing here, have already begun to shake up the VR market, thanks to big names bringing affordable headsets that enable virtual reality experiences. As the Mixed Reality headsets all have pretty similar specifications (which we’ll go into in more detail shortly), what really differentiates them is design and comfort. With Lenovo being one of the more respected brands to bring out a Mixed Reality headset we were expecting big things from this device, both in terms of performance and build quality. The Lenovo Explorer, like other Windows Mixed Reality headsets, went on sale to coincide with the launch of last year's Fall Creators Update for Windows 10. This update brings Mixed Reality compatibility to Windows, including a number of apps that can be used with the headsets. The price of the Explorer, which includes two wireless motion controllers, is $449.99 / £399.99 / AU$799). This is quite a bit cheaper than the HTC Vive, which now costs $599 (£599, around AU$760). Meanwhile, the Oculus Rift has had a permanent price cut to $399 (£399, around AU$640), which may have been in response to the lower prices of Windows Mixed Reality devices. Compared to other Mixed Reality headsets, the Lenovo Explorer is one of the more expensive propositions, with the Acer Windows Mixed Reality Headset selling for $299 in the US on its own, or $399 (about £399, AU$510) with a pair of wireless motion controllers. 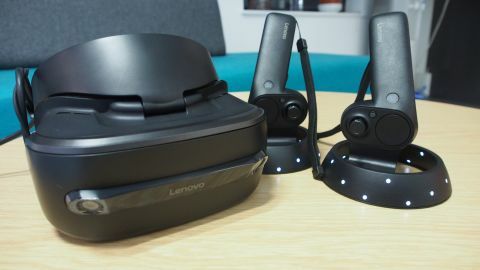 Apart from price, the key differentiator between Mixed Reality headsets is their design, and Lenovo has made a good-looking headset with the Explorer. Its understated black design doesn’t look quite as impressive as the upcoming Asus Windows Mixed Reality Headset, but it looks a lot nicer than the Acer headset, which has a blue and black design that looks a little, dare we say it, cheap. The headset is light enough to wear for a decent amount of time, and a large dial at the back allows you to tighten or loosen the headset so that it sits comfortably on your head – it's a much easier to use method than the straps-and-Velcro design of the HTC Vive. A nice design choice with the Lenovo Explorer is that the visor can be lifted up, which is useful if you want to see the real world without having to take off your headset. It feels a little clunky – the hinge movement isn't quite as smooth as we’d like – but it's handy if you want a quick break. As with other Windows Mixed Reality headsets you get two motion controllers bundled with the Lenovo Explorer, and they're identical regardless of which MR headset you get. While this means that if you don’t like them you don't have the option to swap to, say, Dell’s offering for a different pair of controllers, it does mean that it’s easier for developers to create consistent experiences no matter which headset you use. You're also given the option of using either a keyboard and mouse or an Xbox One controller with the headset, but for the best MR experience the motion controllers are the way to go. The controllers themselves are odd-looking devices that are similar to the HTC Vive controller, being a wand with a circular head and a number of buttons, a trigger at the rear, a side button to replicate grabbing motions, and a touchpad. These similarities mean you can play some VR games designed for the Vive with a Windows Mixed Reality headset, instantly giving the platform a decent library of content. The Mixed Reality controllers differ from the Vive's in that they include a Windows button to bring up installed apps in the Windows Mixed Reality Portal program, and a thumbstick for movement. This thumbstick is a nice addition, and makes movement easier in VR, but until Mixed Reality headsets become more popular we may not see many VR games or experiences make use of it. The rings at the top of each controller have a number of lights that illuminate when in use, allowing the headset to track their movement. The controllers have a light and plastic feel to them, and don’t feel quite as robust as the HTC Vive controllers. They're also each powered by an AAA battery, so unlike the Vive’s controllers you can’t plug them in to recharge. However, it does mean that if the batteries run out you can quickly swap them for a new set, rather than having to wait while you charge them. Hardware-wise the Lenovo Explorer uses two inside-out motion-tracking cameras, a gyroscope and an accelerometer for tracking movement. You don’t need additional devices like the HTC Vive's Lighthouses, which keeps the installation nice and simple. The headset weighs 380g, which doesn’t feel too heavy when in use, though it did leave us with a red mark on our forehead after about 20 minutes. A 3.5mm jack port is also included, allowing you to attach your own headphones. This is nice if you have a pair you like to use, but unlike the Oculus Rift the Explorer doesn’t come with its own headphones. The headset attaches to your PC via a single long (4-meter) cable that splits into a USB 3.0 and HDMI connection. This is much nicer than the mass of cables that spills from the HTC Vive, although of course a wireless version would have been nice. Two 2.89-inch lenses with a combined resolution of 2880 x 1440 and an LCD display offer up the visuals. On paper, this resolution is higher than the Vive’s 2160 x 1200, but lower than that of the upcoming HTC Vive Pro, which will boast 2880 x 1600. It’s also worth noting that the Vive’s PenTile OLED display is superior to the LCD in the Lenovo Explorer. The lenses have a field of view of 110 degrees and a refresh rate of 90Hz, pretty much the same at the Vive. Because there’s no need for external sensors, and now that Mixed Reality is an integral part of Windows 10, the installation process for the Lenovo Explorer is pretty straightforward. We just plugged in the headset, and were prompted to download the Windows Mixed Reality Portal from the Microsoft Store. Once that was done, we were taken through the process of calibrating the headset using an easy-to-understand step-by-step guide. You can use the Lenovo Explorer either sitting down or standing up. If you want to use it standing up, you're asked to hold the headset and walk along the perimeter of the area you’re going to be moving about in. This is a simple way to help Mixed Reality apps keep track of you, while keeping you in a safe area away from objects that could trip you up. It’s a darn sight simpler than the HTC Vive setup procedure anyway. Pairing the motion controllers via Bluetooth was also pretty simple, although it’s worth pointing out that we did have an issue with Bluetooth reception. This is because we were using a desktop PC, and while the motherboard did have a Bluetooth receiver built-in the range wasn’t very good, so tracking became an issue. This was easily remedied with a cheap USB Bluetooth receiver (these can be bought from most online stores for a couple of dollars – just make sure it’s Bluetooth 4.0). With the Lenovo Explorer set up, we tested it out first on the virtual reality ‘house’ from which the Mixed Reality Portal launches MR apps. Graphically, the Lenovo Explorer does a good job, and thanks to the higher resolution the ‘screen door’ effect, where you can see lines between pixels, giving the impression of looking through a screen door, was less noticeable than on the HTC Vive, although it was still present. Because the screen quality isn’t as good, the image quality of the Lenovo Explorer doesn’t quite match that of the HTC Vive. Given the price difference between the headsets, however, we'd say that the image quality is perfectly acceptable. Apps built for the Mixed Reality platform performed well, with standout apps like Free the Night working well to immerse you in their virtual worlds. The smaller lenses of the Lenovo Explorer do mean that your entire field of vision isn't filled, so it can sometimes feel like you’re looking through a scuba-diving mask, with the edges of your peripheral vision simply showing black. It does affect immersion slightly, although after a while you can almost forget this issue. There are a few apps that let you watch 360-degree videos, but the resolution of the videos wasn’t great, which impacted our enjoyment of them. However, this is more a fault of the cameras that took the footage, rather than a fault of the headset, and hopefully we’ll see better videos in the future. We also tried out a few SteamVR games. This requires you to download Windows Mixed Reality for SteamVR in Steam, then launch the games from there. It’s a bit clunky, so fingers crossed there will be a better way to launch SteamVR games through the Windows Mixed Reality Portal in the future. Many of the games we tried worked fine, but there were some issues that illustrate that this is still early days for SteamVR in Mixed Reality. For example, Nvidia VR Funhouse detected the motion controllers, but got them mixed up, so the right-hand controller showed as our left hand in the game, which was all very confusing. Again, this is hopefully something that will get ironed out in the future. Throughout our time with the Lenovo Explorer the motion controllers worked well, and responded accurately in the games and VR experiences we tried. They feel a bit lighter and cheaper than the HTC Vive’s offering, but they were comfortable to hold. They're also graphically represented in Mixed Reality apps, making them easy to use, as you can see where the buttons are when wearing the headset, and in supported SteamVR games the Vive controllers depicted in-game are replaced with the Mixed Reality controllers, which is a nice touch. The headset was comfortable enough to wear for long periods of time, although the cushioned fabric that protects the bridge of your nose sometimes came loose. Also, while the ability to flip the front visor up makes things easier when you don’t want to be immersed in MR for a while, it did mean we had to keep fiddling with it, as if the visor is at the wrong angle the images become blurred. It’s also worth noting that the headset became warm to the touch after around 20 minutes of use. Overall, though, the comfort level of the Lenovo Explorer was very good, with its lighter weight making it more comfortable to wear than other premium virtual reality headsets. Image quality was good, as was motion control tracking, and SteamVR support is promising. It's just a shame that the lenses are a bit on the small side. The Lenovo Explorer is a nicely-designed headset which shows that Mixed Reality doesn’t have to feel cheap, despite the lower price. Speaking of which, this is a decent-value headset, and worth looking into if you've found the HTC Vive and Oculus Rift too expensive. Set-up is nice and easy, and early SteamVR support is encouraging. The smaller lenses mean this headset isn’t as immersive as it could be, and for a straight-up gaming VR headset you may find the Rift or the Vive to be slightly better suited. We have high hopes for Mixed Reality headsets and their ability to disrupt the virtual reality market, and if the Lenovo Explorer is anything to go by those hopes seem justified. This is a headset that offers very good virtual reality experiences, sometimes comparable to what you get with the HTC Vive and Oculus Rift, while also offering more choice and better value. For more casual buyers who want to experience virtual reality, this is a very tempting device. However, it’s not the best virtual reality headset out there – we’d still give that accolade to the HTC Vive, as its larger lenses and better screen quality means the Vive offers a better overall experience. However, if you find the screen door effect of the Vive too distracting you’ll be pleased with the Lenovo Explorer. Microsoft’s commitment to Mixed Reality gives us hope for the platform as well, with a nice stream of MR apps available. Of course, Microsoft is known to drop things quite suddenly if it thinks customers are losing interest – just ask anyone who has a Kinect currently gathering dust. But so far Mixed Reality seems in decent health, and SteamVR’s compatibility with the platform, even in its early stages, ensures there's a huge amount of content for the Lenovo Explorer. It’s one of the best Mixed Reality headsets we’ve tried, and a very good VR headset in its own right.